As the days get shorter, many people like me have the same feeling… “Oh well, no more night running after work”. And then shortly after, the holidays come around and we come to the realization, it’s time to jump into the fat pants again. Working out after work doesn’t have to stop when it gets dark, and here are a few helpful tips to keep you seen and safe while finishing up your evening workout. See Or Be Seen – The number one reason why people don’t work out as much during the winter is they don’t have the right tools. Like a carpenter without a hammer, it’s no reason why you don’t work out in the dark. Your safety is more important than gaining a few lbs’s. Illuminating yourself is just as important as illuminating your path. Many times when we work out at night, you can get by with the city’s street lights or even the run where night time paths are common. Choosing a well-lit path in parks, boardwalks, and near rivers typically has well lit running paths in order to see where you are going. But what stops us is we don’t know how to light up… Until now. EL Wire – Is the best resource for runners. It’s a thin copper wire that weighs practically nothing and is perfect for night running. It’s flexible, can be worn all around your body and can be seen in perfect darkness. What’s nice about this is you can be seen from all sides, not just from straight on. The battery packs that come with them are water resistant and take common batteries, unlike many portable LED Lights today. The wire also comes in a number of fashionable, designer colors, so you don’t have to sacrifice looks for safety. Now your lighting can be as bold as you want to be. Whether you are wearing around your waist, or have it attached to your shoes, EL Wire will be your best friend at night. Headlamp – If you choose not to wear EL Wire, a headlamp is a good idea. If you have the resources to use both EL Wire and a headlamp, this will ensure you will be seen, and keep you safe as day. The downside of a headlamp only is that it is only effective when coming from straight on. The most common accident runners have is being hit from the side, or from behind, all due to not being seen. The second most common accident night runners have is not hearing oncoming traffic. Making sure to remove the headphones when running at night is a good idea, as it keeps you aware of your surroundings. 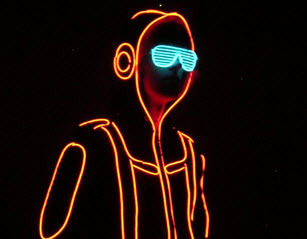 You are much less likely to be in an accident when Night Running if you are wearing apparel that is glowing. Be prepared and glow before you lace up your shoes and you make sure to stay out of your fat pants all winter long.